Fedora 24 was released last month and lately I tried it after installing on my HP Pavilion dv6 model and the overall experience is awesome. In this article, I am covering up the installation of Fedora 24 along with the different desktop environments, minimum system requirements, features and what's new in the latest release and things you should do just after installing Fedora. If you wish to install and use Fedora as your primary OS, you need to have these minimum system requirements for it's smoother functioning. You can grab a Fedora 24 copy from Fedora website : https://getfedora.org/workstation/download/. There are options to download 32/64 bit versions. I would suggest you go for a 64-bit version. If you are on Windows host, you can create the live USB through liveUSB creator. 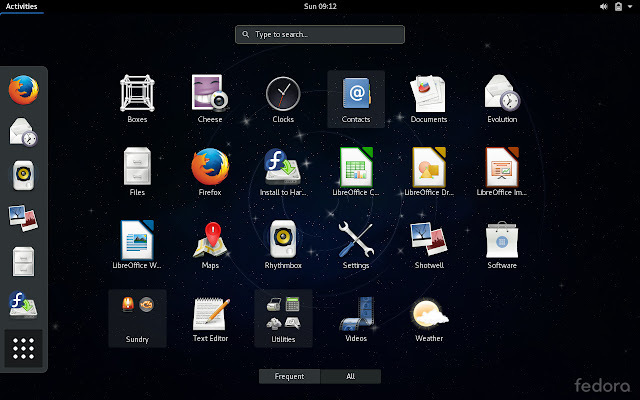 If you are using Ubuntu, you can use the similar software - Unetbootin. You can use the command line too from Ubuntu or other Linux distros to create a live USB. You can either use the live USB to try out Fedora 24 before you decide to switch completely to it. Or, if you have been already using it and want the latest release, you can install it along with other OS or completely replace it. Virtual Box is a great way to try out, and even work out on distros without having the pain of creating a separate partition and having to worry about the GRUB menu troubleshooting. The advantage of VM Ware for people like me is that we can't create unlimited no. of partitions for trying out the different flavors of Linux with limited hard disk space. Installing Fedora 24 in Oracle VM Virtual Box is very easy and it will take some min at max. You need to set up a virtual machine first and then use the ISO you downloaded to install the Fedora 24 in the virtual box as a fix OS. The process of dual booting Fedora 24 along side with Windows involves the step as of Installing Fedora 24 in Virtual Box. The additional steps involves creating a partition and making sure you do not actually over write the Windows partition in the process of dual booting Fedora 24 with Windows 10. I say this, coz I have done this mistake once and lost all my data. Rest all steps are same as Installing Fedora 24 in Virtual Box. This is all for today, we will be covering some more topics related to Fedora OS in coming days. Thanks for reading this, do subscribe to our blog.